Kristen Hannigan, senior trainer at the Georgia Aquarium, helps in the release of penguin chicks that were rehabilitated by the Southern African Foundation for the Conservation of Coastal Birds at Stony Point near Cape Town, South Africa, Dec. 8, 2016. Twenty-three rescued African penguins that had been abandoned several weeks ago along the coast of South Africa were released back into the wild Thursday, according to officials at the U.S. aquarium who helped rehabilitate them. 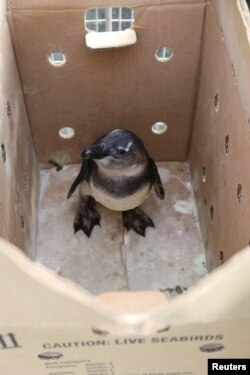 Experts from the Georgia Aquarium in Atlanta and the Southern African Foundation for the Conservation of Coastal Birds, which treats threatened seabirds, transported the penguins in cardboard boxes to the coast near Cape Town, where they waddled on the sand before swimming out to sea. As many as 900 African penguins are rescued and need rehabilitation each year because of environmental factors such as oil spills, food shortages and habitat degradation, according to the aquarium. An African penguin that was rehabilitated by the Southern African Foundation for the Conservation of Coastal Birds is seen prior to its release at Stony Point near Cape Town, South Africa, Dec. 8, 2016. Experts from the Georgia Aquarium, which has a colony of African penguins and a breeding program, have been traveling to South Africa since 2009 to help in rescue efforts, a spokesman for the aquarium said. The population of African penguins, Spheniscus demersus, has dropped 60 percent in the past 30 years. It is considered an endangered species by the International Union for Conservation of Nature and is on its Red List of Threatened Species. The black-footed, medium-sized penguin is confined to the waters of southern Africa.